Waller, Smith & Palmer, P.C. 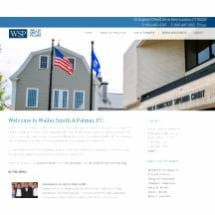 is a Connecticut firm engaged in general law practice. The firm was formed in 1885 by Thomas W. Waller and his son, Tracy Waller. Thomas Waller had previously served as governor of Connecticut from 1883 until 1885 and as United States Consul General to London. Since its founding the firm has continuously maintained an office in New London, CT. Attorneys from the firm appear in all Connecticut courts, including probate courts and all federal courts. The attorneys at Waller, Smith & Palmer, P.C. are members of the New London County Bar Association, Connecticut Bar Association and American Bar Association. They maintain active memberships in professional associations specializing in particular areas of law such as the American College of Probate Council, the Southeastern Connecticut Estate and Tax Planning Council, the American Association of Trial Lawyers, the Connecticut Association of Municipal Attorneys, and the American Arbitration Association. Waller, Smith & Palmer, P.C. maintains a comprehensive law library and has a computer system for legal research, data processing and word processing. Attorneys of the firm attend professional seminars to continue their legal education. Waller & Waller, the original name of the firm, has been known by a succession of names over the years, but has most commonly been known as "the Waller firm." As part of a continuing New London institution, the firm's members have influenced the development of the City and Southeastern Connecticut as trusted advisors to banks, business, industry and local government. They have played leading roles as individuals in directing major public works projects such as Ocean Beach Park and the first Gold Star Memorial Bridge. Some have been recognized by their peers as outstanding trial lawyers, others as preeminent office lawyers. Some have served on the bench as municipal, state and federal judges; others have been prosecuting attorneys and public defenders for the state. Members of the firm have raised tens of thousands of dollars for non-profit organizations and have helped organize legal services for the poor. Many have held elective office. All have volunteered their time to community affairs. The history of Waller, Smith & Palmer is interwoven with the threads of the history of New London County over the last one hundred twenty-five years. Like any multi-generational saga, it includes some fascinating characters, some colorful tales, some accounts of great personal achievement and some days of sadness, but throughout professional excellence.